As I've said, it's not just cool trucks or beautiful cars that interest me. It's their owners/drivers. 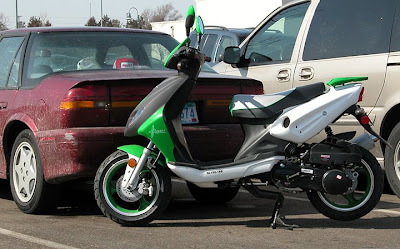 I came across this vignette in a parking lot at a Minneapolis mall last weekend, and am still trying to figure out under what scenario someone would park their scooter immediately behind someone else's car. There were numerous empty spaces, so it wasn't a case of desperate to shop. "I know you are in that mall, and you are not leaving until I say so." "Hey, let's go to the mall. My scooter only has one seat, I guess you'll need to bring your car." "Race ya to the mall!" "I'd like to ditch that darn scooter, but no one will buy it." I cannot come up with a rational explanation for this scene.